#A119 Primitive Stitchery Pattern, Prim "Bunny in Tulip Garden!" 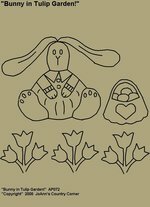 Primitive Stitchery Pattern, Prim "Bunny in Tulip Garden!" measures 6 3/4" x 7 1/2". #A120 Primitive Stitchery Pattern, Prim "Sammy the Rabbit!" 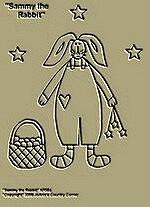 Primitive Stitchery Pattern, Prim "Sammy the Rabbit!" measures 6 3/4" x 6 3/4". #A121 Primitive Stitchery Pattern, Prim " Hugs and Kisses Heart!" 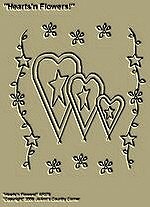 Primitive Stitchery Pattern, Prim "Hugs and Kisses Heart!" measures 7"x7 1/2". 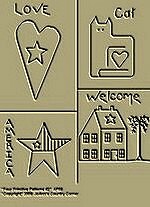 #A122 Primitive Stitchery Pattern, Prim " God Bless America Flag!" 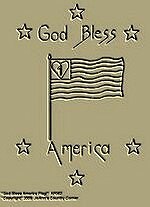 Primitive Stitchery Pattern, Prim� "God Bless America Flag!" measures 6 1/2"x9". 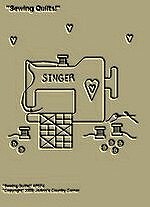 #A124 Primitive Stitchery Pattern, Prim "Sewing Quilts!" Primitive Stitchery Pattern, Prim "Sewing Quilts!" measures 6 1/2" x 6 1/2". 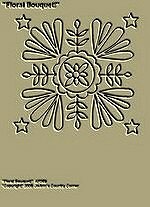 #A127 Primitive Stitchery Pattern, Prim "Floral Bouquet!" Primitive Stitches Pattern, Prim "Floral Bouquet!" measures 6 1/4"x 6 1/4". 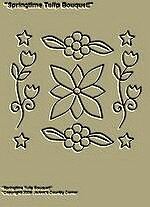 #A128 Primitive Stitchery Pattern, Prim "Springtime Tulip Bouquet!" Primitive Stitchery Pattern, Prim "Springtime Tulip Bouquet!" measures 6"x6". #A131 Primitive Stitchery Pattern Primitive "Hearts'n Flowers!" 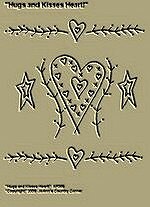 Primitive Stitchery Pattern Prim "Hearts'n Flowers!" Pattern measures 6 3/4"x7 1/2". 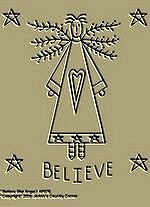 #A130 Primitive Stitchery Pattern Primitive "Peppermint Petunia and Snow Pea Seed Packets!" "Primitive Stitchery Pattern, Primitive "Peppermint Petunia and Snow Pea Seed Packets!" Pattern measure 7"x8 1/2". #A132 Primitive Stitchery Pattern Primitive "Flowers Feed The Soul Tea Cup and Saucer Bouquet!" 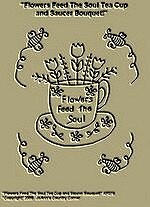 Primitive Stitchery Pattern Prim "Flowers Feed The Soul Tea Cup and Saucer Bouquet!" measures 6 1/4"x 7 1/2". #A133 Primitive Stitchery Pattern Primitive "Wreath of Stars, Red, White and Blue!" 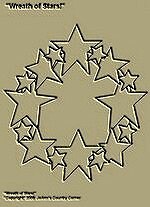 Primitive Stitchery Pattern Prim "Wreath of Stars, Red, White and Blue!" measures 7 1/4" x 8". 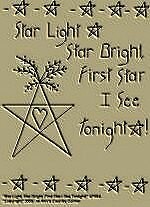 #A140 Primitive Stitchery Pattern Primitive " Star Light, Star Bright, First Star I See Tonight! Primitive Stitchery Pattern Primitive "Star Light, Star Bright, First Star I See Tonight!" measures 6 1/2"x8 1/2". 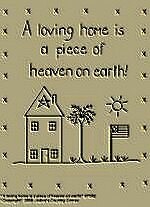 #A135 Primitive Stitchery Pattern Primitive" A loving home is a piece of heaven on earth!" 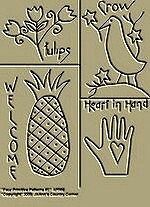 Primitive Stitchery Pattern Primitive "A loving home is a piece of heaven on earth!" measures 6 1/4"x 8 1/4". 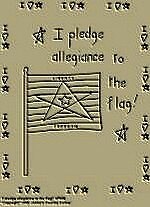 #A136 Primitive Stitchery Pattern Primitive "I pledge allegiance to the flag!" Primitive Stitchery Pattern Primitive "I pledge allegiance to the flag!" 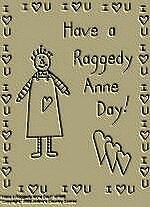 #A137 Primitive Stitchery Pattern Primitive "Love You More!" 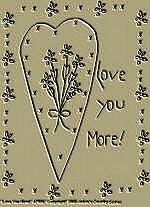 Primitive Stitchery Pattern Primitive "Love You More!" measures 6 1/2"x9". 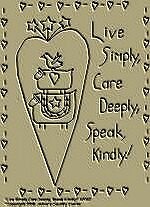 #A138 Primitive Stitchery Pattern Primitive "Live Simply, Care Deeply, Speak Kindly!" Primitive Stitchery Pattern Primitive "Live Simply, Care Deeply, Speak Kindly!" measures 6 3/4"x9".